Art that features initials is so versatile. It looks great as part of a wall display, on a shelf, or on a door. It could make a great gift for a baby or child – it makes a kids – and the parents – feel so special to see their name on things! There are lots of great ideas for projects featuring artistic initials, and I want to try them all! I decided to start with a simple 3-dimensional cut-out initial wrapped in paper or fabric. Here’s how I did it! 1) Buy or make a base letter: I’ve seen oversize wooden and cardboard letters at craft stores, so you could definitely start with one of those. 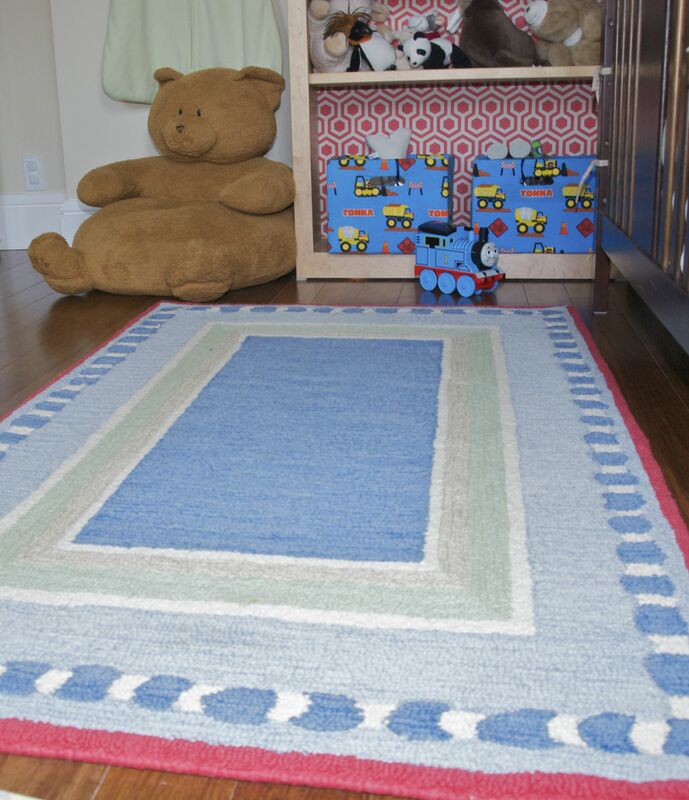 In this case, I was feeling lazy and cheap – not to mention I do my projects when the kids are either napping or in bed at night, which makes trips to the craft store hard! So, I decided to cut out my own letters from cardboard. I had some extra-thick cardboard leftover from “dish pack” boxes from our move. These are great for lots of cardboard projects, because they are made from a double layer of corrugated cardboard and thus stronger and warp less. You could print out the letters you want, enlarge and then trace them, but I decided to wing it freehand. 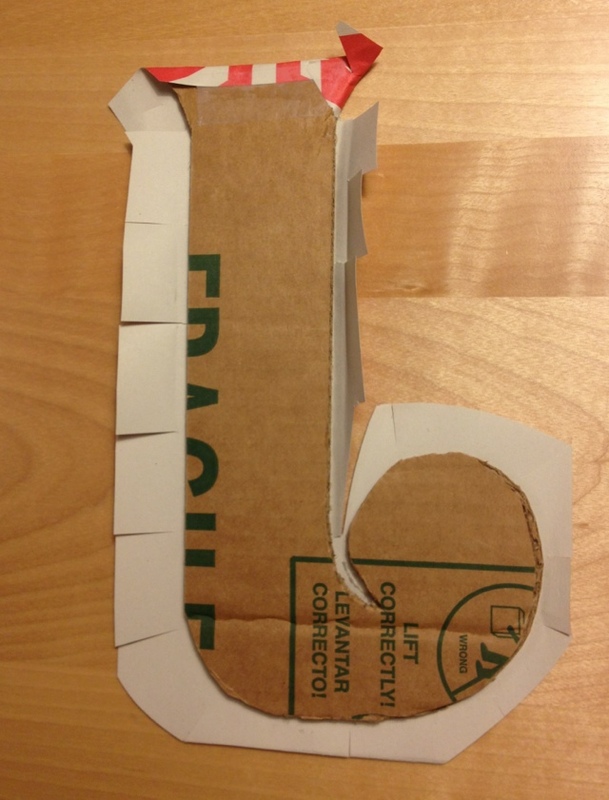 First, I decided on the overall dimensions I wanted – nine inches high – and marked that area on the cardboard. Then, I sketched the letters inside the space, using a ruler to make the straight lines. I also made some of the areas a little thicker than they are in the original font, so they would not be too fragile when cut out. 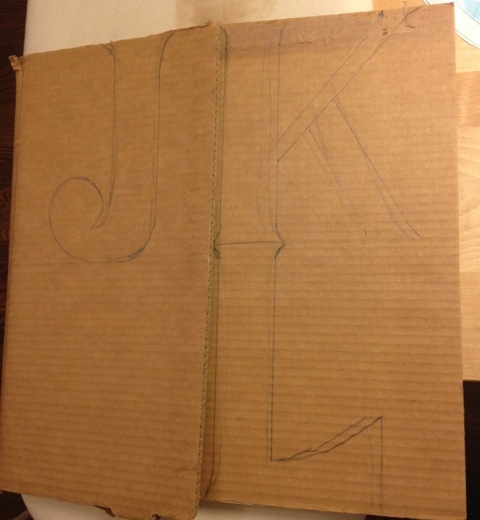 I ended up using a popsicle stick to reinforce the thin part of the “K.” Also try to avoid narrow gaps – the inside curve of that “J” turned out to be tricky to wrap around. I used white glue on the very short tabs of paper and held them in place by wedging some bubble wrap in the gap until the glue dried. It turned out fine. 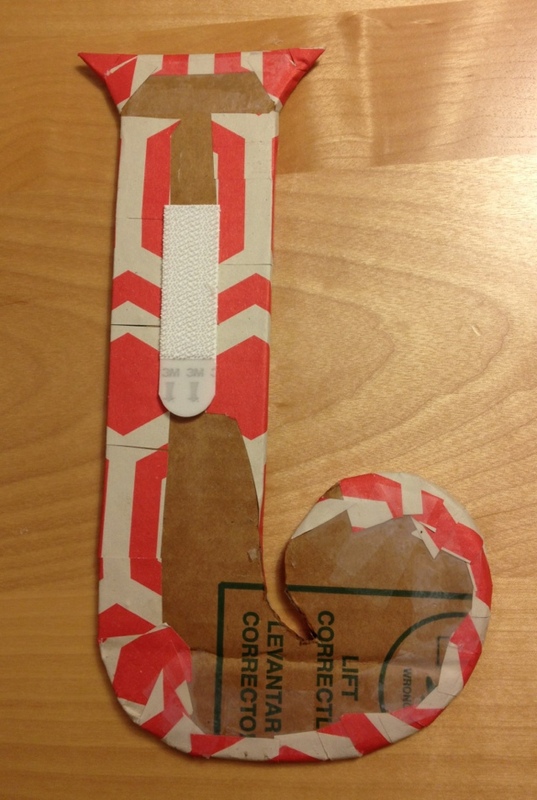 Sketch or trace the letters onto cardboard using a ruler to help. Make sure the lines are not too thin and also try to avoid narrow gaps. 2) Apply paper or fabric: This is where you could get creative and use scrapbook paper, wrapping paper, maps, photos, fabric, whatever! 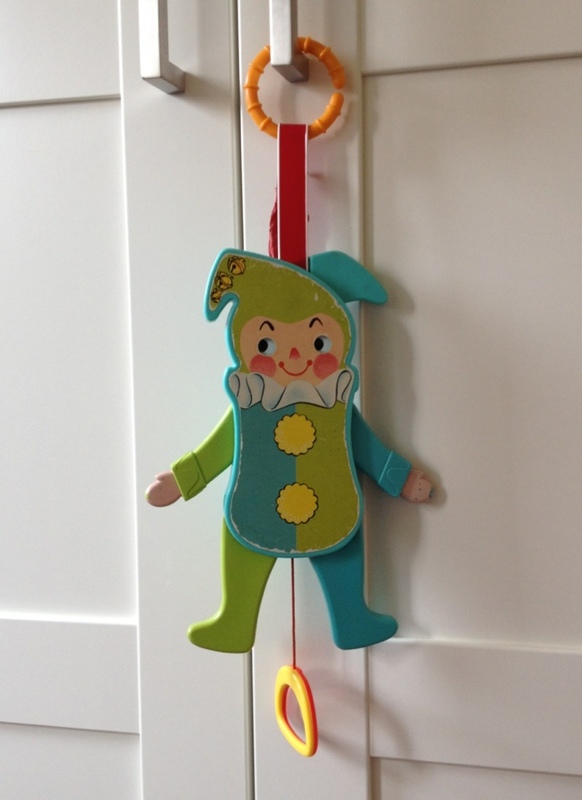 I would recommend cutting leaving a one inch margin around your letter – I didn’t have that much, because I was using a scrap leftover from decorating the back of our little guy’s bookcase, which made it harder. Also, if you are using corrugated cardboard, I would just put a couple of spots of glue from a glue stick on the front, because if you glue it down thoroughly, the corrugation will show. Cut tabs to help ease the paper around curves and corners and then glue down the tabs. Because I had a small margin, I needed to use some tape to help. Once I had the paper wrapped around, I used a popsicle stick with a little white glue on it to help smooth any areas where you could see the tabs, like around the curves. Lightly glue your letter to the back side of your paper or fabric. Cut out with a one inch margin (more than I had!) and cut tabs for the corners and curves. Glue! 3) Voila! and Finish! You could clear coat your letter with clear spray paint or Modge Podge. I wouldn’t do it with the corrugated, because, again, it would make the corrugation show through. It would be a nice finish for wooden letters, though. Finished product! A 3-D initial wrapped in beautiful paper. 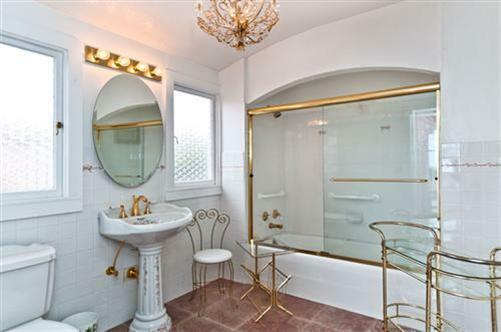 4) Hang and enjoy! I’m using 3M Command Picture Hanging StripsEdit. These are very easy to use and have the additional benefit of adding more dimension to the letter, so it really stands out from the wall. 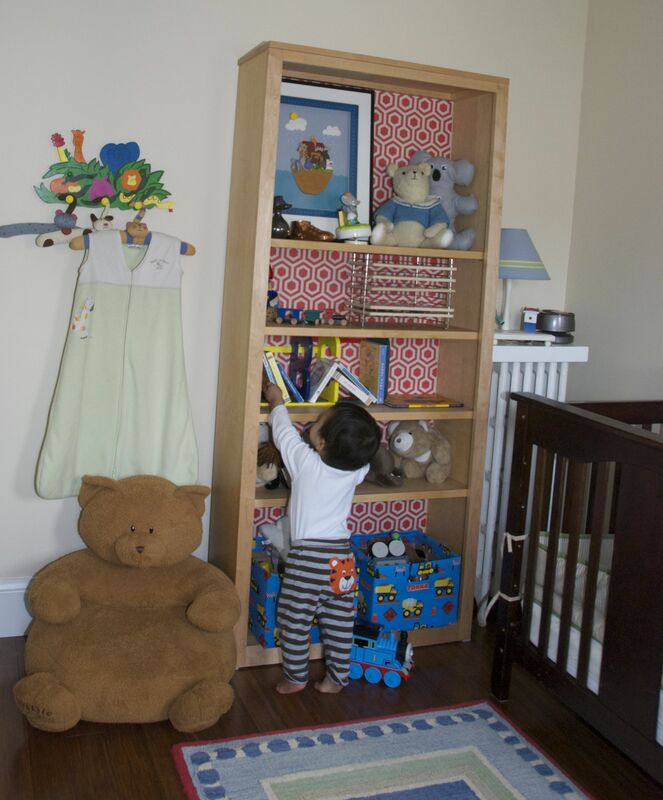 3M Command (TM) Picture Hanging Strip – easy and removable! 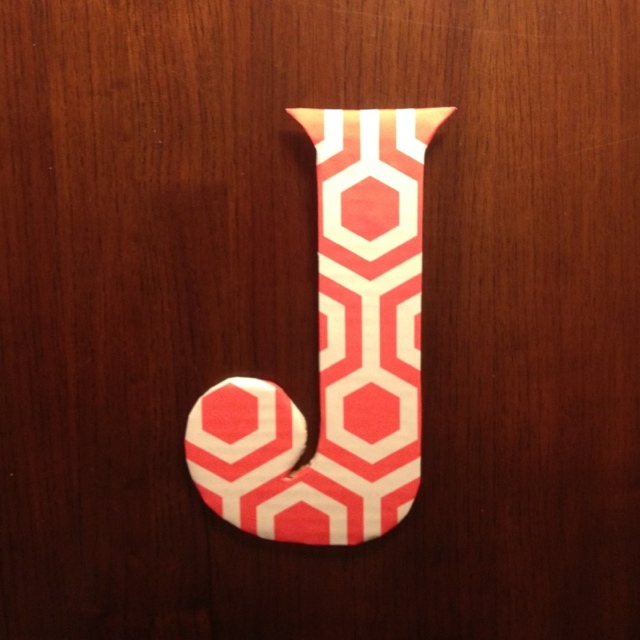 This initial is for our youngest’s room as part of the wall collection below. 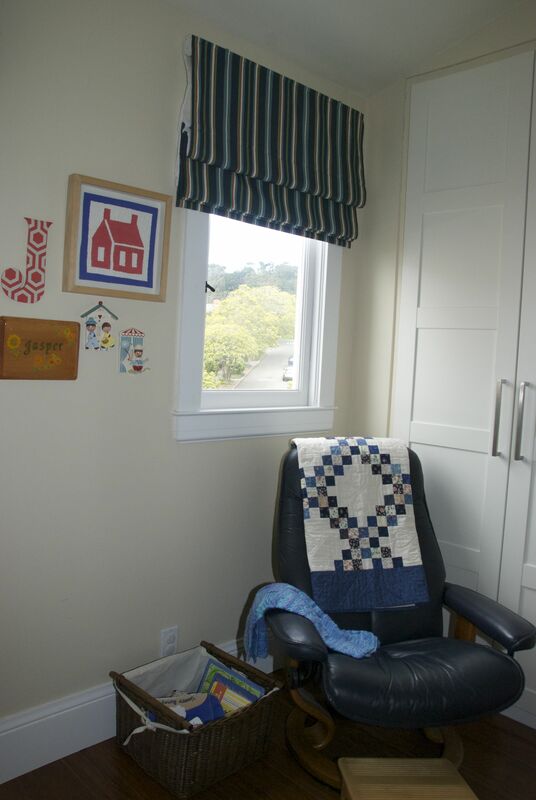 The “quilt block” is actually made of paper and was a gift from my friend Penny many years ago. 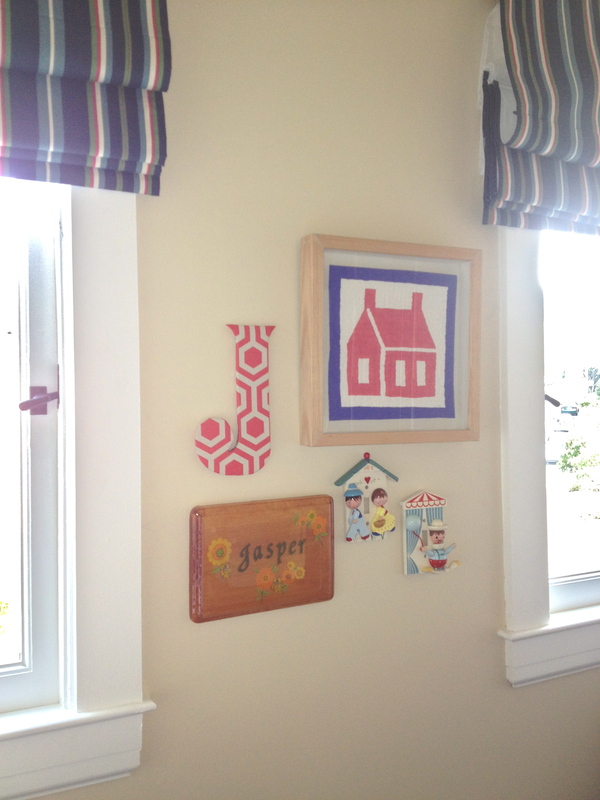 And the vintage nursery switch plate covers go beautifully here, too. The one on the left is mine from when I was little. The other one was picked up at a garage sale for $1. They can also be found on eBay for about $15-25. I didn’t really have a functional use for them, but I think they work perfectly in this display. This whole wall relates back to the other side of his room, where the same paper is lining the bookcase, and a vintage lamp from my childhood provides a reading and night light. 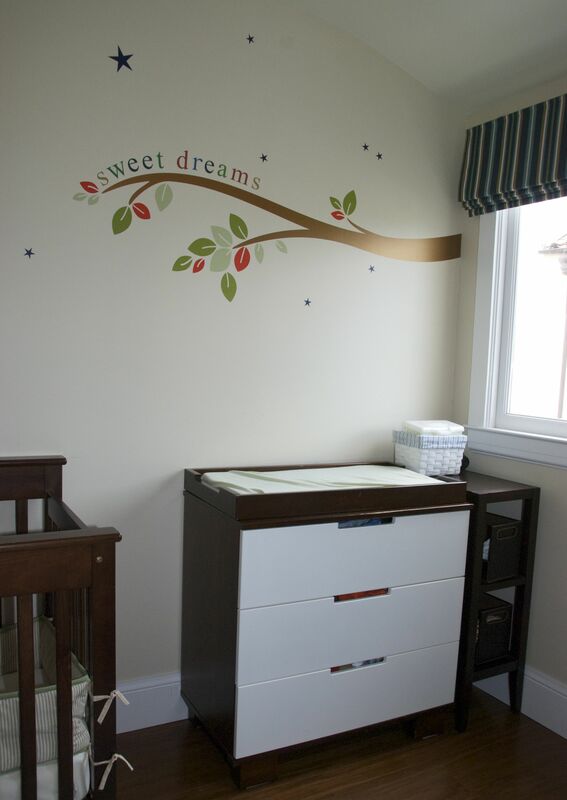 The “J” in its place on the nursery wall. 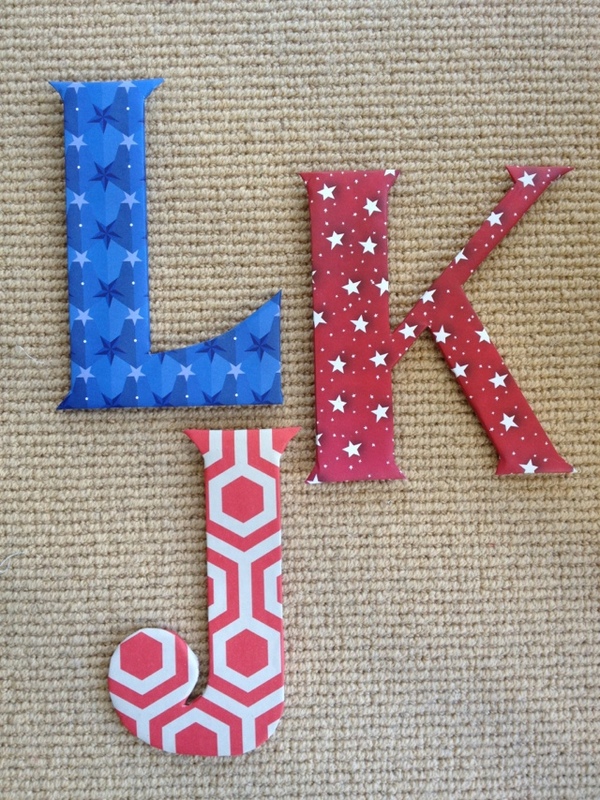 And now, here’s a sneak peek at the other kids’ initials! I let them pick their own paper. I was thinking stripes, but I love how the stars turned out.